One rapper and at least three bloggers known for their online activism and commitment to freedom of speech in Tunisia, have been detained by the police yesterday, January 6. Ali Abdulemam is a pro democracy advocate and a leading citizen journalist in Bahrain. He has been held in solitary detention since September 4th, 2010, and there is a serious risk of him facing torture. Join our global campaign to free Ali. Please spread the word. Ali Abdulemam who runs the Bahrainonline.org forum, a pioneer of the Internet in Bahrain and an advocate of freedom of speech has been arrested by the Bahraini government under the charge of “spreading false news.” The Bahraini government has been waging a massive crackdown on dissent lately. Please spread the news by tweeting, blogging, sharing and posting this banner, and posting on your status on facebook to show solidarity and force Ali’s release. Frontline Defenders: “Bahrain: arrest of human rights defender and leading blogger Ali Abdulemam and ten other human rights defenders”. September 6. 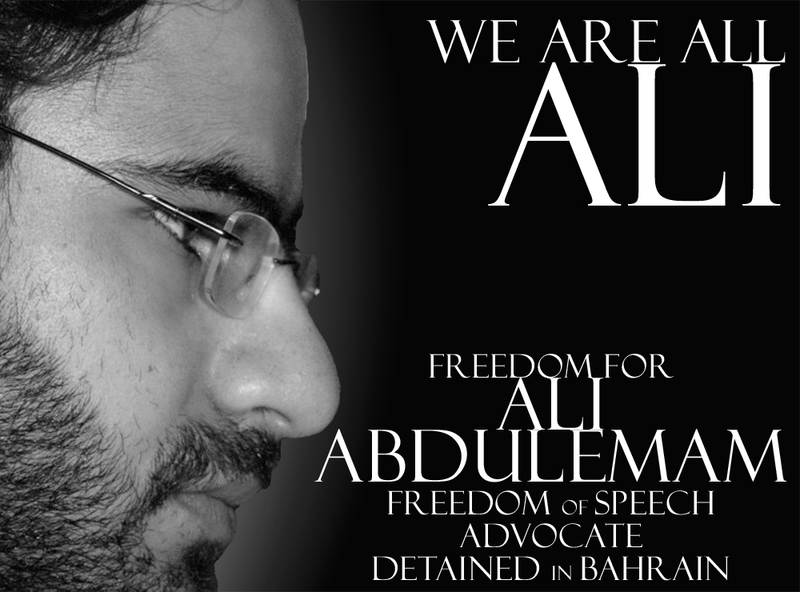 Free Detainees: “Bahrain: Ali Abdulemam, blogger and Global Voices contributor arrested”. September 5. Bahrain Center for Human Rights. September 6. The Arabic Network for Human Rights Information. September 6.